I was really excited when I made these blocks of soap. 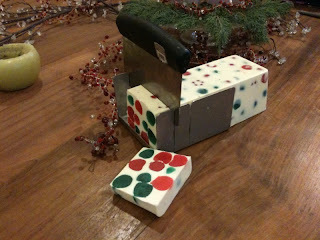 I had planned to do a Deli style of selling, cutting and weighing out the soap. The blocks can be made so each slice is about 150 gms or 100 gms. I think this will be a fun way to interact with your clients, have a bit of time to discuss about the soap. The important message about these soaps are that they are bio-degradable and do not contain any petrolleum by products. This would be fun thing to sell on a school carnival, cart selling or anywhere you want to sell something different. The cutter is also included for loan if anyone is interested in selling block soaps. Ingredient listing of the soap will also be provided.